Solar Batch Water Heaters are the most basic and simplest type of solar thermal collector and which can best be described as basically a tank in the sun. They are called “batch water heaters” because the collector is both a thermal storage tank and solar collector in one in which the water is heated and stored a batch at a time, hence their name. The acronym for a batch type solar water heater is “ICS”, meaning “Integrated Collector and Storage”. Batch water heaters, or ICS’s, are plumbed in-line with the domestic water system to preheat the water for conventional or instantaneous water heaters. As they rely on mains pressure to circulate the water, no pumps, controls or electricity is needed for there operation making them both a cheap and a great DIY project. When hot water is required by the household, the solar pre-heated water is drawn into the conventional water heating system under mains pressure. Since the water has already been heated by the sun in the batch collector, this reduces the energy consumption required to heat the water if the water is already warmer. A solar batch heater can warm the water enough that the electric or gas water heater stays off all day, especially during sunny afternoon. As a passive solar thermal energy heating system, the batch solar water heater can be a low cost alternative to a more expensive pump driven active hot water system, as it has no moving parts, low maintenance, and zero operational cost. Batch collectors can be made from any old conventional hot water heater tank but generally use a water tank inside an insulated box with a glass or plastic cover. The glass top allows the sun’s heat into the storage tank, and the insulated sides decrease heat wastage from the water storage tank back to the environment. 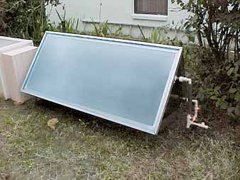 There are many commercially available solar water heating tanks that can be purchased. Commercial batch collectors use metallic absorber plates, multiple metallic flow tubes or tanks, and double glazed glass all contained within a single insulated box. These materials increase the weight, cost to say nothing about the additional installation expenses. Saving the planet is a great idea, but saving money is an even greater idea so having a used water tank painted black to absorb more solar heat as part of a DIY solar hot water system is also good. Batch water heating has several advantages that makes it useful in the appropriate situations and can be a good low cost investment for heating water for a household of 2 to 4 people. But since the batch collector holds your hot water storage on the roof overnight, it is essential that the storage box is fully glazed and sealed and have only about one third of the collectors tubing exposed above the insulation to prevent convection of the hot water back into the atmosphere, acting as a sort of radiator in reverse. The best place to position your solar water heater is in the back yard, and home-owners can install the units by themselves on the ground floor. This will allow you to have easy access to it when you need to. If you live in the northern hemisphere you should angle it facing south. This will ensure that it gets the maximum benefit and more sunlight. Naturally you need to locate it somewhere were it will not be affected by any shade or obstructions. Another good tip for saving costs is to place it as near to your electric or gas water heater as you can to reduce the required plumbing. If your installing your own DIY collector, it will also make your project a lot simpler for you. One of the main disadvantages of a solar batch water heater is freeze protection. As a solar batch water heater contains large volumes of water, they should generally only be installed in milder climates due to the outdoor pipes freezing in cold weather. When used in freezing temperatures most people will empty them during the colder winter months or whenever there is a chance of the pipes freezing. For these colder winter months you could use a biomass stove or fireplace heat exchanger during this period for heating your domestic hot water. Using a solar water heater makes the most economic sense almost anywhere in the world especially now that the prices of fossil fuels are at a very high level. Batch heaters offer an economical alternative for home-owners with limited budgets and/or small demands on hot water. Building your own solar water heater is a very good option, and there are a number of resources where you can find DIY (do it yourself) solar water heater system. Even if you are a novice with do-it-yourself projects, the DIY solar water heater is still a good project for you to do. All you would need is a good book for instructions. To learn more about “Solar Batch Water Heaters” and other types of flat plate solar collectors and how you can use them to heat the water in your home, or to explore the advantages and disadvantages of using Click Here to get your own copy of one of the top “Solar Thermal Guides” from Amazon today and make solar domestic water heating a reality. This is actually a good idea, very cool! We recently put up solar panels a week ago and now my husband wants to install a solar water heater which I am not a fan of. But it was intriguing to read that since the water has already been heated by the sun in the batch collector, this reduces the energy consumption required to heat the water if the water is already warmer. I am no expert but I would imagine this would do a better job than the water heater we have right now! Hi what a great website this is that I’ve discovered. For my central heating and hot water I use grade A energy efficient LPG boiler. Its a condensing combi boiler that is just over 1 year old. This boiler is fed by 1 cold water feed, that is then heated, and sent to my hot taps on demand. I wonder whether it would pay to install 1 or 2 black painted radiators on the south facing wall of my house, between the cold feed and the boiler. This, I think would have the effect of raising the cold water feed temperature significantly, maybe even 40 degrees celsius on a hot sunny day, and therefore reducing gas consumption in the boiler. I’m starting a new project, I want to build a batch solar water heater, I been reading about how to build it here in this article, my question is, can it be done with a gas water heater core or it has to be an electric water tank?, does anybody had built one with a gas water heater core and had any trouble building it? any other alternatives?